Corticosteroids are used in AD to control inflammation. These preparations are very effective in controlling skin lesions of AD, but should be used wisely. There is little role for systemic corticosteroids in the management of AD except in the most severe cases. When used, oral corticosteroids should be prescribed for only a limited time and should be tapered judiciously. The skin disease will typically clear quickly with the use of oral corticosteroids, but frequently relapse once their use is discontinued. In addition, the side effects associated with use of systemic corticosteroids are well known and generally preclude their use. Topical corticosteroid use in AD is the mainstay of therapy. The potency of topical steroids used is dependent on the severity of the skin disease and the location of skin lesions. In general, topical steroid potency is related to the vehicle and the chemical preparation. Gel preparations penetrate more effectively, but are drying and therefore not of great benefit in AD. Ointments penetrate well and enhance hydration, but feel occlusive and may be poorly tolerated during periods of high temperature (i.e., summer). Creams and lotions are less potent and penetrate less effectively than gels or ointments, but are more comfortable to some patients. Except in mild cases, ointments should be used because of their higher penetrance and potency. The lowest strength that gives adequate results should be used. Halogenated corticosteroid preparations, such as 0.1% betamethasone (Valisone), 0.025% fluocinolone (Synalar), and 0.1% or 0.025% triamcinolone (Aristocort, Kenalog), have potent anti-inflammatory properties and can be used sparingly on affected body lesions. These preparations should not be used on the face and neck. Hydrocortisone cream or ointment, 1%, can be used sparingly on the face and neck, but stronger preparations should be avoided. Topical steroids should be applied twice daily after application of lubricating creams or ointments as discussed. These preparations will penetrate the lubricant and reach the affected skin. Although generally safe from systemic absorption, diffuse application of topical steroids over long periods can have the adverse effects of striae, atrophic thinning of skin, ulcerations, hirsutism, acne, and telangectasia. In addition, cases of adrenal suppression secondary to use of topical steroids have been reported. Although these complications are rare with prolonged use of low-potency topical steroids, their use in children and adults with severe disease should be monitored. 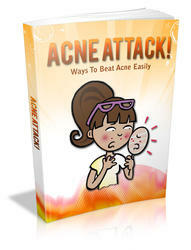 This Book Below Will Show You Exactly What You Need To Beat Your Acne!